Brown the beef over medium heat, breaking it up as it cooks. Once cooked, drain the fat. Add the marinara sauce to the skillet with the beef and warm over medium heat. Stir in the cream cheese and sour cream until melted and creamy. Turn heat to low and cover pan. Wash the zucchini and cut the ends off. 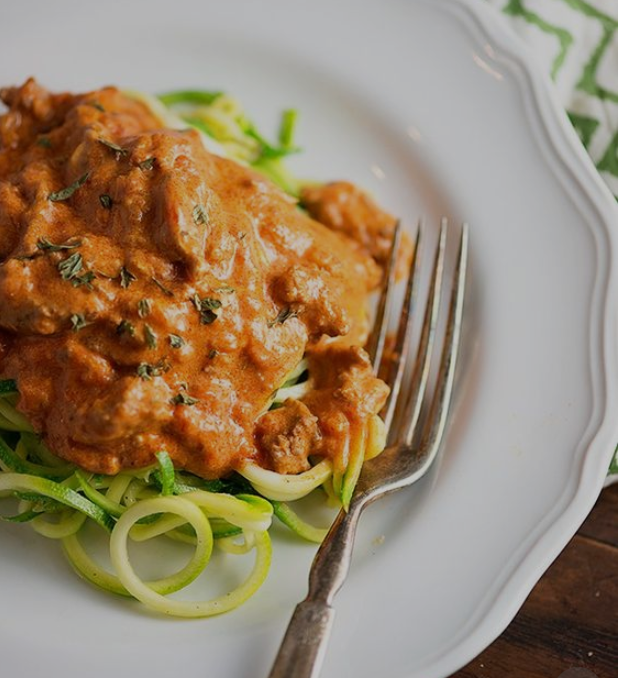 Using a spiralizer, cut the zucchini into noodles. Place a large skillet over high heat. Spray with non-stick cooking spray. Add the zoodles to the skillet (you may need to do this in batches) and cook, tossing often, until the zoodles reach the texture you prefer. The longer you cook them, the softer they get – but they also release more water as they cook. I find that 3 minutes is just enough to take off a bit of the crunch, but keep them from releasing too much water. Serve sauce over the zoodles and enjoy!